Global Goa Party: this weekend!!! This weekend, on July 17-18, 2010, the Global Goa Party will be going off on DI.fm for their world-wide broadcast, and all of the mixes will be made available for download here at the Goat Ranch as well. Now, you can of course experience the party in whatever fashion you wish, but I highly recommend either tuning in to the DI.fm broadcast on Saturday, or downloading and listening to all of the mixes in one session. Simply carve 15 hours out of your weekend or call in sick to work, because the mixes are best listened to in true psytrance party fashion – one right after the other. For FIF. TEEN. STRAIGHT. HOURS. The good guys running the DI.fm Goa-Psy channel have graciously offered to broadcast every mix from the Global Goa Party – back-to-back and in order – on July 17/18, 2010. The times obviously vary depending on your time zone, but here’s your chance to really crystallize the whole “global” part of this thing and tune in with listeners from around the world! If you can’t make the broadcast on DI.fm or want 320kbps sound quality, don’t despair – the mixes will be posted on Friday night (US MST) for downloading at your convenience. Therefore, you can start downloading in time to join in the fun on Saturday, or you can download any other time and party on whenever you like. 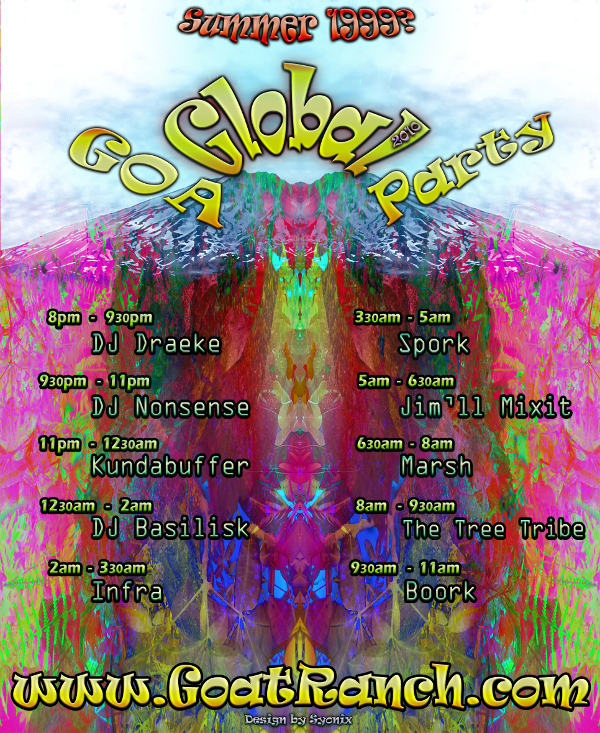 The Global Goa Party was conceived to bring together ten DJs from around the world to create the soundtrack for a full night (and morning) of old-school Goa and psychedelic trance. The year of this never-to-have-happened party is 1999, and the DJs were encouraged to put together sets consisting of tracks released in or before that year. The call went out with ten time slots available for the choosing, and DJs from Canada, Italy, Norway, Singapore, Spain, Sweden, the UK and USA answered the call. With over 15 hours of music mixed with a party in mind, the opportunity presents itself to invite a few friends over, dust off the black lights and those old fluoro tapestries, and get a real-life party going in your living room. Hope you enjoy this as much as I have!